Minnesota Timberwolves (NBA) inked 26-year old Australian international swingman Mitch Creek (195-90kg-92). He played recently at Long Island Nets. In 42 NBA G League games he recorded very impressive stats: 15.2ppg, 5.6rpg, 2.3apg and 1.0spg this season. Creek also played for the Nets earlier that season where in four NBA G League games he averaged 3.8ppg, 2.5rpg and 1.3apg. 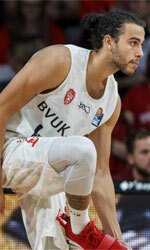 He also spent pre-season at s Oliver Baskets (BBL) in German league. Creek has never been drafted by the NBA. Among other achievements his team won Australian NBL Regular Season in 2017. Creek received also Australiabasket.com All-Australian Premier League Player of the Year award and Australiabasket.com All-Australian Premier League Defensive Player of the Year award back in 2016. He has been also a member of Australian international program for some years. Creek has regularly played for Australian senior team since 2017 and previously for U22 National Team in 2015. He represented Australia at the FIBA Asia Cup in Lebanon two years ago. Creek's team won Gold and his stats at that event were 6 games: 14.7ppg, 5.2rpg, 2.3apg, 1.8spg, FGP: 70.0%, 3PT: 50.0%, FT: 66.7%. Creek has played previously professionally in Germany (BG Goettingen) and Australia (Adelaide 36ers, Spectres, Noarlunga City Southern Tigers, Australian Institute Sport and South Adelaide Panthers). His game is described as: A true star at Junior level, where he can use his athletic skills and powerful body. But he needs to add perimetral shooting and passing, because his future is at 2 position, not sure at the 3-4 where he plays now.